MADRID | Following German Chancellor Angela Merkel’s instructions, those supposedly at command in Euroland zealously repeat that growth and austerity are not in contradiction. Beware about such a slim talk. Their underlying message is that fiscal compact must be preserved at all costs, growth delivery amounting to a merely cosmetic make-up. Eurocrats are working out ways to sell through financial engineering the same money under a more “à la mode” disguise. These well-intentioned top people fail to see that growth builds both on confidence and money. So they deprive their strategy from both essential items. Instead, they attach utmost importance to impose to unrealistic targets to countries in distress, thus fuelling impoverishment processes meant to be the price to regain competitiveness. By making things worse they only add to existing problems amplifying the gap in public finances. In their candid attempt to push for a lower equilibrium they overlook the risk of plunging ailing economies in a never-ending free fall. Lord Keynes lecturing has made no apparent impact on them. Confidence can only be built on credible targets. Otherwise, uncertainty and speculation are the only to be deserved. Growth also needs money, that is, enough credit to finance a pick-up in activity. Draghi has hastily shelved the ECB medium term facility as soon as Italian sovereign debt crisis has been largely overcome. He has also ruled out any interest rate rebate notwithstanding his pledge to address growth. Spain stands as the main loser in this middle-of-the road strategy. It desperately needs the credit channels to work out properly. Yet its financial reform has come under fire from the IMF and the ECB that have openly questioned banking solvency. The so-called economic diplomacy intended to sell abroad the country trade-mark has so far proved unable to pave off scathing and destabilising remarks on its financial system soundness. 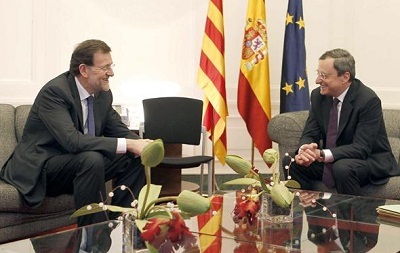 Instead, the Spanish government seems all too ready to cave in to outside pressure. It has announced the intention to provide green light to bad banks, thus undermining the merits of its own financial reform. No wonder bold measures so far taken fail to impress investors. They have been poorly explained and the lack of a comprehensive plan establishing the main priorities reduces such an effort to a patch-work of disparate initiatives. Be the first to comment on "Slim talk about growth in Euroland"